UPDATE! Congratulations to Cecilia Lu for winning the Amoda Tea prize! Thanks to all who entered. Tea lovers, rejoice! As the grey skies cast puddles of rain all around, few things can be as comforting as the company of a good book and steaming tea. While you could venture outdoors to find that perfect blend, a new BC company has made tea time a lot easier. In Sanskrit, it means “joy, peace, serenity and aroma”. Amoda could not be a more suitable name. Built on the belief that every cup of tea should be an experience, Amoda Tea sources blends from ethical producers around the globe. 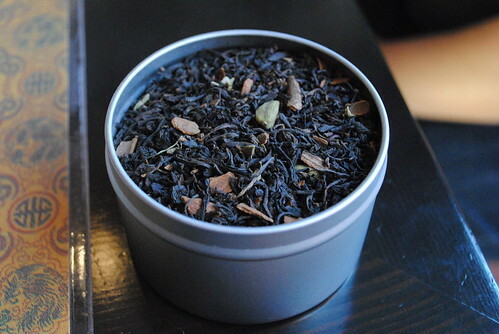 If you’ve ever set foot in a gourmet tea shop, you know how overwhelming the options can be. Amoda Tea has taken the guesswork out of the equation and instead delivers monthly tea tasting boxes directly to its customers at home. With holiday shopping around the corner, gifting a monthly tea subscription is a thoughtful option for those both near and far. To celebrate the launch of their tea-licious endeavour, Amoda Tea has graciously offered one Keira-Anne.com reader a three-month Amoda Tea subscription plus a $20 credit for the online store (total prize value: $65). I will draw one lucky winner at noon on Thursday, November 8th. To learn more about Amoda Tea and how the monthly gourmet tea subscriptions work, visit Amoda Tea online. You can also find Amoda Tea on Facebook and Twitter. Winner must be 16 years of age or older. Winner cannot have won a contest on Keira-Anne.com within the last six months. This prize is transferable to someone of the winner’s choosing though it is of no monetary value. Tea boxes can only be shipped within North America. Keira-Anne.com nor its affiliates or the contest prize sponsors bear any responsibility to the winners, the collection of the prize and/or the use of the prize. I love a hot cup of tea on a rainy fall day; it’s so comforting. If I won the Amoda Tea, I would gift it to my husband who just loves tea! He drinks it more than coffee and it’s his favourite thing to have when he first wakes up and right after dinner. I have to admit I would keep the tea for myself I agree, nothing is better than curling up with a good book and a cup of steaming tea on a chilly day. Amoda Tea FB page liked! I love tea so i would keep this for myself! To a friend who supported me through this last very challenging year. Have tried and enjoyed your midnight magic tea. I would gift this to my friend who is enjoys his tea. I would keep some for myself and give some to my grandparents….they love tea as well! I would gift this to my hubby who loves tea! I’d gift it to myself – loooove tea! I’d gift it to myself! I’d give the tea to my manager at work. She really enjoys all kinds teas, and it would make a nice early Christmas surprise.